It features a single relay output, for cooling or heating purposes, combined to a cyclical timer for natural defrost. The natural defrost can be forced or performed through an off refrigeration cycle. It also features a configurable digital filter, which has the aim of simulating an increase of mass in the environment sensor, thus increasing its response time, that is, the sensor response becomes slower. 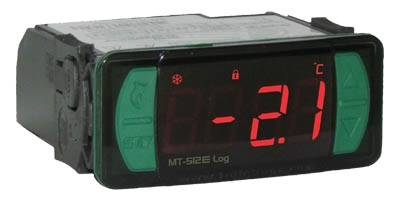 In addition to those features, the MT-512E Log has tamper-proof function that blocks the keypad preventing unauthorized users changing its settings, and a control function shutdown that deactivates the controlling outputs turning the instrument into a digital temperature indicator. Have an open-door indication and an internal memory for data storage (datalogger), which allows for recording the measured temperature and the control output status at user-determined intervals. Evolution line products has a frontal IP-65 protection, Flatec key for easy access, four digits display and exclusive accessories* such as the key programmer EasyProg and the protective case Ecase. refrigerated counters, cooling chambers, heated tracks and greenhouses.